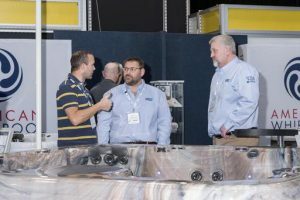 Hot tub and swim spa product specialist Aqua Warehouse Group is preparing to launch a new bespoke e-commerce system service for dealers to gain extra profit streams from online sales for little cost and effort. Aqua Warehouse Group chief Richard Hart, pictured right, was among the busiest exhibitors when he showcased his distributor status for the new American Whirlpool brand from MAAX Spas to the UK market at SPATEX last year, and during the recent 2019 edition he was one of the major stars from the hot tub and swim spa sector in the seminar programme organised by the Institute of Swimming Pool Engineers (ISPE). Richard; who is an established Vita Spa hot tub and swim spa distributor and has secured European distributor status for the Covana automated cover systems, along with the existing responsibility for the UK network of dealers; was delighted with the response to his new bespoke e-commerce strategy and thanked the audience of the packed out SPATEX seminar for their attendance. Dealers were informed that they could quickly gain extra revenue streams from the new online purchasing system, which is expected to go live within a couple of months, for just £250. 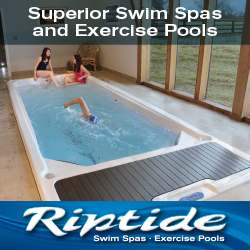 Once dealers have their own website geared up with their individual company and bespoke wet leisure product shop branding it will run seamlessly through a digital link to the Aqua Warehouse Group system. This then effortlessly takes care of all of the order processing, including taking the payment and ensuring prompt delivery. After orders are secured and processed the dealer receives their margin on a monthly statement from the product sales generated within that period. They can also keep a check on the processing element via the online system at any time of the day. “A top quality e-commerce site traditionally costs between £5,000 and £15,000 but we’re providing a bespoke web shop capability for dealers for a fraction of that with just the small fee of £250,” explained Richard. “We want to differentiate between accessories and chemicals. Our aim is not to focus on the online chemical sales but to try and increase the sales of accessories for our dealers. To allow dealers to keep track of the orders that are placed from their website, they will be provided with a unique log in capability to gain access to details of what products have been ordered and delivered, as well as being provided with reverse invoices to ensure proficient accounting. “Dealers will have their own log in capability to allow them to check their stock orders, delivery status and profits whenever they want,” said Richard. “This ensures that there will be complete transparency throughout the ordering and delivery process with a reverse invoice for any products that are ordered from the dealer’s individual site. Meanwhile, John Mabey has reported that the Aqua Spa Supplies division of Aqua Warehouse Group is flourishing and sales of wet leisure accessories, including specialist spa fragrances, are continuing to grow. “Sales of steps and cover lifters continue to remain very strong and sales of fragrances are also going mad at the moment. We’re shifting hundreds of orders a week. To sign up to the new bespoke e-commerce scheme or to obtain further information contact Aqua Warehouse Group on 01245 477400. For stand bookings for SPATEX 2020 at the Ricoh Arena in Coventry, running from January 28 to 30, contact the SPATEX team via email: michele@spatex.co.uk or helen@spatex.co.uk or directly by telephone on: +44 (0) 1264 358558.